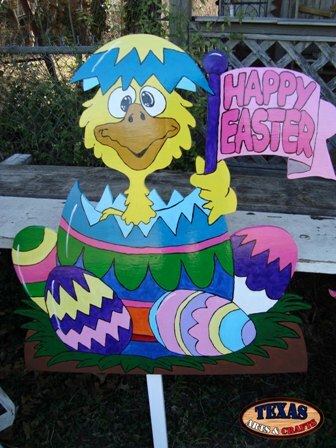 The Happy Easter Chick is cut out in our workshop. The chick is hand painted yellow. The chick is inside a multicolored Egg. There are also multicolored eggs around the chick. The dimensions for the chick are approximately 36 inches tall by 33 inches wide by 2 inches deep. The sign weighs approximately 9.75 pounds with packaging. For the continental U.S. shipping and handling is included in the listed price. For shipping outside the continental U.S. please contact us through our Contact Us page. The Easter Chick Artist is cut out in our workshop. The chick is hand painted yellow. The dimensions for the chick are approximately 23.25 inches tall by 18 inches wide by 2 inches deep. The sign weighs approximately 3.50 pounds with packaging. For the continental U.S. shipping and handling is included in the listed price. For shipping outside the continental U.S. please contact us through our Contact Us page. 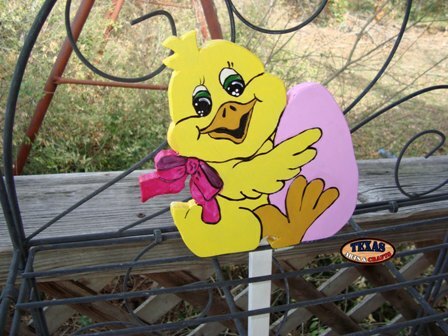 The Easter No Eggs Chick is cut out in our workshop. The chick is hand painted yellow with a no eggs sign. The dimensions for the chick are approximately 20.25 inches tall by 15.50 inches wide by 2 inches deep. The sign weighs approximately 2.75 pounds with packaging. For the continental U.S. shipping and handling is included in the listed price. For shipping outside the continental U.S. please contact us through our Contact Us page. The Chick Cleaning Egg is cut out in our workshop. The chick is hand painted yellow. The chick is removing the color off a multicolored egg. The dimensions for the chick are approximately 15.50 inches tall by 21 inches wide by 2 inches deep. The sign weighs approximately 3 pounds with packaging. For the continental U.S. shipping and handling is included in the listed price. For shipping outside the continental U.S. please contact us through our Contact Us page. The Crack Me Chick sign is cut out in our workshop. The chick is hand painted yellow. 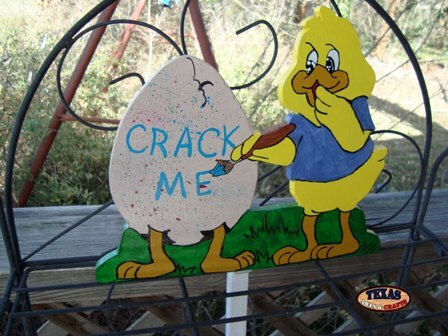 The chick is painting crack me onto the white egg. The dimensions are approximately 10 inches tall by 12.50 inches wide by 1.25 inches deep. The sign weighs approximately 2 pounds with packaging. For the continental U.S. shipping and handling is included in the listed price. For shipping outside the continental U.S. please contact us through our Contact Us page. The Chick With Egg sign is cut out in our workshop. The chick is hand painted yellow. The chick is holding a pink egg. The dimensions are approximately 7.50 inches tall by 7.50 inches wide by 1.25 inches deep. The sign has a 11.50 inch stake. The sign weighs approximately 1.25 pounds with packaging. For the continental U.S. shipping and handling is included in the listed price. For shipping outside the continental U.S. please contact us through our Contact Us page.